A good friend graciously transcribed the following from a recent class I was planning to audit called Corey Hart’s Lessons In Thermodynamics. Awkward Young Woman (interrupting): Wait, you’re Corey Hart? Corey Hart: Yes, and this is Lessons in Thermodynamics. Awkward Young Woman: The Corey Hart? Awkward Young Woman: The one from that video my mom loved in the 80’s? Corey Hart: Yes. May I continue? Awkward Young Woman: Um, yeah, it’s your class. Corey Hart: Thank you. Now, as you may or may not recall, not only is heat required to raise the temperature of any solid to its melting point, but the melting itself requires heat and that’s called the heat of fusion. Melting points are often used to characterize organic and inorganic compounds and to ascertain their purity. The melting point of a pure substance is always higher and has a smaller range than the melting point of an impure substance or, more generally, of mixtures. The higher the quantity of other components, the lower the melting point and the broader will be the melting point range, often referred to as the “pasty range”. The temperature at which melting begins for a mixture is known as the “solidus” while the temperature where melting is complete is called the “liquidus”. Eutectics are special types of mixtures that behave like single phases. They melt sharply at a constant temperature to form a liquid of the same composition. Alternatively, on cooling a liquid with the eutectic composition will solidify as uniformly dispersed, small (fine-grained) mixed crystals with the same composition. Awkward Young Woman (unable to take it anymore): Wait, glasses don’t possess a melting point? Not even under extreme heat, like, in a car on the hottest summer day on record? Corey Hart: No, upon heating, they undergo a smooth glass transition into a viscous liquid. Upon further heating, they gradually soften, which can be characterized by certain softening points. Awkward Young Woman: So, why did you wear your sunglasses at night? As you can tell, I missed this class. 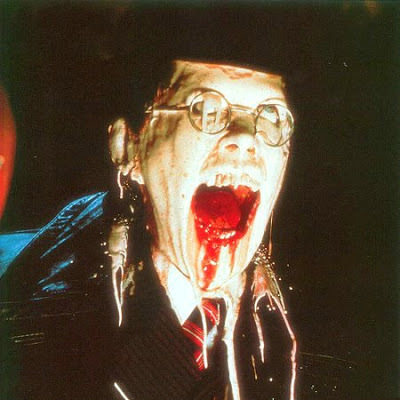 So, when I got in my car after work and put my sunglasses on, I looked like this.